We have a selection of adhesives to suit your situation. Note for powder adhesives they usually come in 20kg bags and for the ready-mix wall adhesive it usually comes in 15kg tubs. As a rough estimate, the average coverage for 1 bag or tub is about 5 or so square metres but please do check with your tiler or email us for advice. 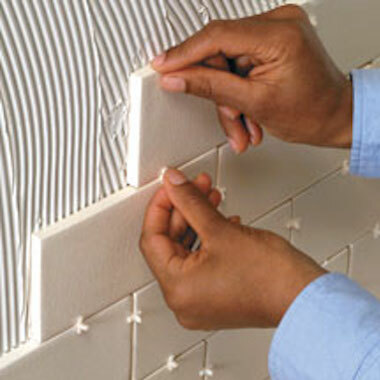 For floor tiles, larger wall tiles and porcelain we recommend using a powder adhesive. There are 3 main things to consider: 1) Flexible or Non-flexible adhesive... if you have any movement in your floor e.g. you are tiling onto ply or backerboard secured timber, or you are using underfloor heating, a flexible adhesive is a must. 2) Grey or White... for lighter tiles, choose white rather than grey. 3) Rapid-set (approx. 2.5 hours) or Standard-set (approx. 24 hours)... depending on if you would prefer some time to adjust the layout and design or time is of the essence and the quicker you can get grouting the better! Drop us an email with details about your tile and floor for further information or support.